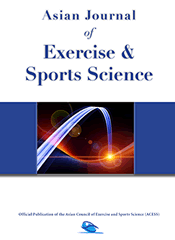 The Asian Journal of Exercise and Sports Science (AJESS) is the official publication of the Asian Council of Exercise and Sports Science (ACESS). The journal publishes empirical and theoretical contributions that enhance knowledge in the art and science of human movement. Areas of interest include: adapted physical education, anatomy and physiology, biomechanics, dance science, exercise and sports psychology, exercise physiology, health and fitness, history and philosophy of sport, measurement and evaluation, motor control and learning, motor development, nutrition, sociology of sport, sport management and administration, sport medicine, and sport pedagogy. The main purpose of AJESS is to stimulate and disseminate research and scholarship throughout the international academic and professional community. AJESS is truly committed to publishing contributions from all regions of the world, thus promoting international communication among scholars and practitioners. Innovative applications and unique studies of cross-cultural nature are especially encouraged.